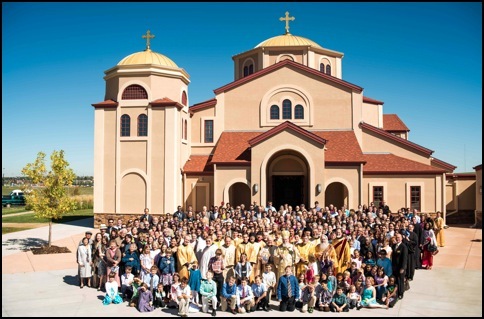 St. Luke Church in Erie, Colorado was consecrated by His Grace Bishop BASIL on Sept. 28, 2013 with 318 faithful present including neighboring clergy. A joyous reception in the church hall followed. It was a wonderful day of thanksgiving to God. The new temple had its first Divine Liturgy on Pentecost 2010. Since that time, a wood carved iconostasis from Bulgaria was installed along with additional iconography that now covers most of the ceiling under the dome. The church has grown in numbers since its beginning in 1991 with 17 households using a small rental space in the old mining town of Lafayette, Colorado (a small community 10 miles from Boulder and 30 miles north of Denver). His Grace Bishop ANTOUN ordained Fr. David Mustian and chrismated the original founders who were all converts to Holy Orthodoxy. The church continues to have many converts, along with a good mix of life- long Orthodox members from various ethnic backgrounds. In 1996 the first temple of this congregation was built and the altar consecrated. Additional founding members quickly outgrew this building, and efforts began to secure another location that ultimately led to the move to Erie, Colorado (a couple of miles from Lafayette). After a series of miracles from God the congregation built the new temple over a period of a several years. There was much hard work and sacrificial giving. The desire was to build something beautiful and traditional for God, with land to expand for a larger parish hall and classrooms in the future (there are 9 acres). "We have learned a lot over the years and all the glory belongs to God," says Fr. David. Enjoy photos of the celebration. Here are video highlights of the sermon Bishop BASIL delivered at the consecration of our temple.